Genealogy traces your lineage, Family History is more encompassing and looks beyond the bare bones of birth, marriage or death dates, and illustrates aspects like individual stories behind the facts, relating them to a historical context. This is where the Otaki Branch of the New Zealand Society of Genealogists steps in and helps. There will be specialists to help put the pieces together or to break down the brick walls you may have encountered. There will be research desks to help you, with specialists in Scottish, Irish, English and Whakapapa researchers on hand. 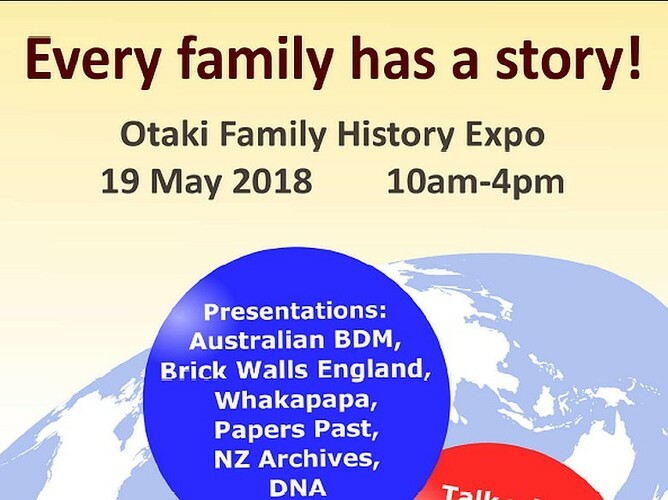 NZ Archives, Papers Past, NZ birth Death & Marriages and the Otaki Historical Society are there to support your NZ-research. Find out how to start your journey in family history, how to go about having your DNA tested, listen to expert presentations, discover links and stories.